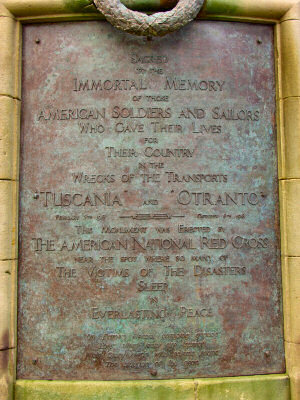 On my main Isle of Islay site I have a page about the HMS Otranto and HMS Tuscania memorials with a number of pictures and some details about the disasters. I wrote this page a few years ago using some material Carl Satter had sent me and pictures I had taken during various visits to Islay. The material included a report from The Scotsman, which is now available online: An interesting report American lives lost in Scottish waters by Jennifer Veitch links to The Scotsman archive from the 9th of February 1918. Some old pictures in the report as well. Finally Ron has an entry about the disaster on his weblog, some pictures of the two ships included.